As an old Traveller RPG fan this map was a real pleasure to make. Megatraveller was the second RPG I’ve ever played. Why this is so meaningful thing for me requires a little anecdote. When I was a kid we had D&D and Runequest in Finnish, but no scifi RPGs at all. I got my Megatraveller from my class mate when I was in the 6th grade, but it was all in English. My English was not that good at that time (we start studying English in Finland in the 3rd grade), but I was very intrigued by all the illustrations in the game. As I did not have any options, I took my English-Finnish-English dictionary in my other hand and Megatraveller in the other and started translating the books word-by-word. You could say that Megatraveller was the game that got me started in English RPGs. I read through the books during my summer holiday and when I got back to school, we started playing it. And we played a good few years until I got other RPGs in my hands. Now I have maybe 6 shelf-meters of RPG books (plus a pile of board and miniature games on top of that). But the biggest thing for me was that when I was reading through the Megatraveller books at the age of 13 or so, I had a dream. I dreamed that one day I could make an English RPG of my own. I’m still working my way towards that goal, and getting closer. Maybe in a year or two that dream can finally come true. 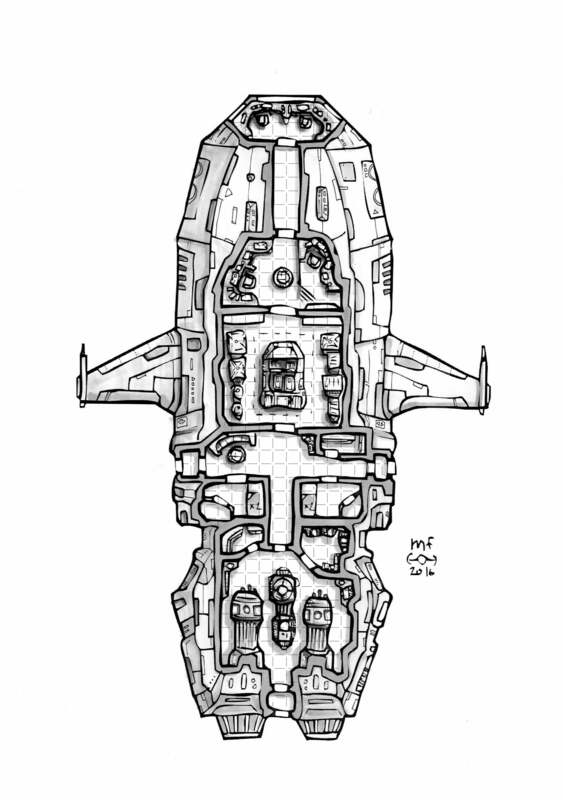 To be honest, I had not touched my Megatraveller books in decades before one of my $5 tier patrons handed me a draft of this ship’s layout and asked me to draw it (custom maps are one of the $5 tier perks). The draft said that this is a Vargr Pocket Scout, even though this ship design does not have the usual hallmark features of the Vargr ships – e.g. the needle like shape and forward curwing wings – I did deviate from the draft only slightly. 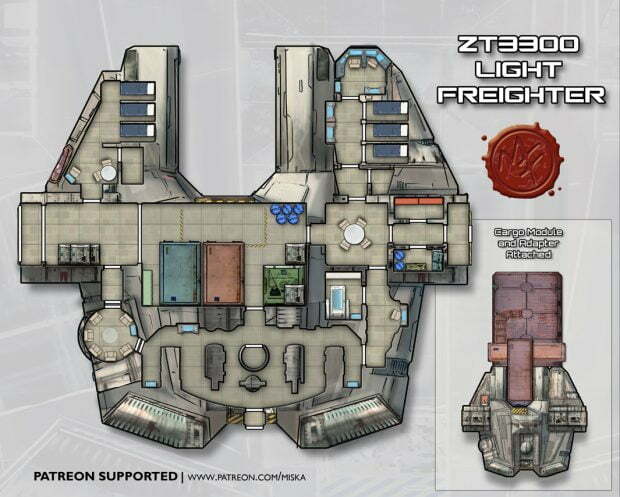 Anyway, the Spinward Marches are vast and the Vargr have ships with more traditional ship designs as well. First I drew a smaller draft of the ship with my 0.5 and 0.3 Staedler and Neopiko fineliner pens on a Rhodia notepad. I actually traced this through by using the first model made by using a ruler. Then I scanned the drawing, vectored the lines and increased the size to A4/letter. Next I printed the vectored line art and added the details with 0.1, 0.05 and 0.03 fineliners and the shading with Copic markers. Finally I scanned the map again and did a little cleaning up in Photoshop, added the texts, grid and background texture. If you would like to get my maps a month before they are published here and support my work, please, check out my Patreon page. You can find more of my maps also on DrivethruRPG and RPGnow.